The Bandung art scene has traditionally boasted innovative and adventurous artists. The Institute of Technology, Bandung (ITB) was the first in Indonesia to focus on formal art training. As ITB Art Department’s third female graduate, Umi Dachlan (1941-2009) demonstrated the same consistency in innovation and creativity as other artists from the city but it is only in recent years that her works have been given deserved attention, with 44 paintings and drawings appearing at auction in the past seven years. Umi started out working from the principles of artist and ITB art professor Ahmad Sadali (1924-1987). After graduation and working tirelessly from 1969 to 1999, she gradually emerged from her teacher's shadow to develop her own iconography, earning her a seat at the table within the discourse of Indonesian abstraction, alongside artists such as Mochtar Apin (1923-1994), Popo Iskandar (1927-2000) and A.D. Prious (b.1932). 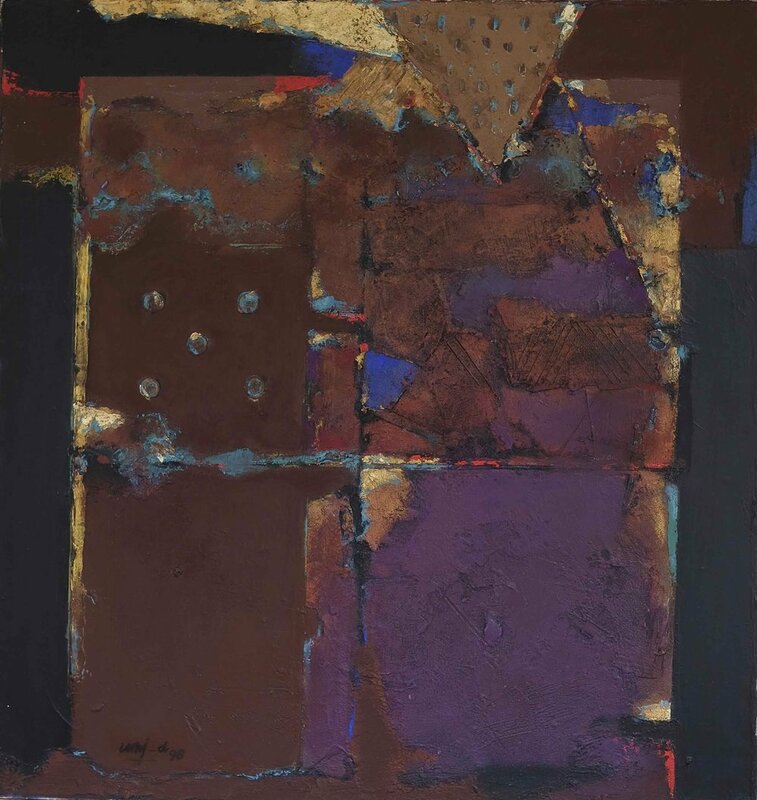 What sets Umi's works apart from those of other male abstract painters is her use of elements such as the shades of her signature colour purple, the mixed-media addition of ancient coins to signify an association with the archaic, and the recognisable textural accents upon the surfaces of her works. Umi paints what touches her, literally, sparking off an imitation of textures of surfaces she comes into contact with in nature, such as that of the earth or rocks. Her abstraction of the forms she observes in nature results in symbolic rather than representational elements resting on the canvas surface. Umi Dachlan, ‘Contemplation’, oil and mixed media on canvas, 100 x 95 cm, 1998. Image courtesy of Art Agenda, S.E.A. These remarkable qualities can be seen most clearly in Umi’s ‘Contemplation’ (1998). The varied tones of maroon and violet are layered upon terracotta and crimson abstracted from various observations in nature, and adorned with copper coins from a forgotten past. The addition of gold pigments finishes the composition off with sentiments of the antiquated, commanding senses of grandeur. The painter also mimics surface textures of boulders and stones through the layering of oils and faint scratching, organising nature’s almost uncontainable qualities within her own structure through her act of contemplating nature. Umi Dachlan, ‘Terracotta and Three Coins’, mixed media on canvas, 35 x 45cm, 1999. Image courtesy of Art Agenda, S.E.A. Umi Dachlan, ‘Contemplation’, oil and mixed media on paper mounted on board, 36 x 40 cm, 1996. Image courtesy of Art Agenda, S.E.A. Umi grew up in a religious household, and was always conscious of her upbringing as a Muslim. The combination of Umi’s personal alignment with Islamic philosophy and appreciation of nature results in the textural abundance and naturalistic forms that appear in her works frequently, such as in the works ‘Terracotta and Three Coins’ (1999) and ‘Contemplation’ (1996). Religion and nature can be said to be two of her strongest aesthetic stimulus, and abstraction was a style that she could most freely express the sensations she felt when immersed in nature. Umi Dachlan is an Indonesian abstract artist in the second generation of the Bandung School who is just now beginning to claim her rightful place within the post-war Indonesian art historical discourse. It will be interesting to see how her works will be viewed and appreciated in the years to come.